Our PW126 Pinecrest is part of our Modular Home series. The PW126A is a three bedroom, two bathroom ranch with an inviting exterior. The Pinecrest Ranch has a double dormer optioned with vertical shake siding to give the exterior some curb appeal. A formal entry foyer welcomes you into the home with a great drop zone closet, and a credenza with space for storage. The entry foyer is open into the living room, showcasing an open concept floor plan. The Kitchen is showcasing our White Cabinetry option along with our Vermont Maple Cabinetry on the island. 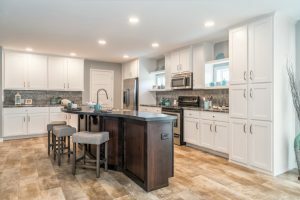 The kitchen has great eye appeal with a full ceramic tile backsplash with mosaic ribbon accent, WilsonArt Countertops and Frigidaire Appliances. Recessed lighting paired with the two kitchen windows and patio door in the nook give great light to the space. The Kitchen also includes an extremely large walk-in pantry with storage space galore! The Master Bedroom is located right off the living room, it features a large walk-in closet space as well as an attached bathroom. The secondary bedrooms and second bath are off of the nook, along with the laundry room. This laundry room is gorgeous, and very functional. 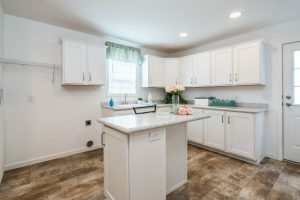 Laundry Sink, Storage Cabinetry, folding island, and space for more with this laundry room you might enjoy doing laundry! Take a tour of this home by visiting our website and walking through our Virtual Tour of this ranch! Kitchen Featuring our Classic Craft Factory Built Cabinetry in White and Vermont Maple! A laundry space you might enjoy! This entry was posted in News on March 26, 2018 by hshearer@commodorehomes.com.